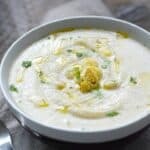 This delicious Roasted Cauliflower and Garlic Soup is dairy-free, Whole 30 and Paleo compliant, but your family will never know! Place the cauliflower chunks and onion slices on a baking sheet. Drizzle on 2 Tablespoons of olive oil and season with salt and pepper. Toss to evenly coat. Place the garlic bulb on a piece of foil, drizzle with oil, season with salt and pepper, and place on the baking sheet. Place in the oven and bake until the cauliflower is golden brown, about 30 to 40 minutes. Add the broth, thyme, and cayenne pepper to the pot. Bring to a boil, then reduce heat to medium-low. Simmer for 10 minutes. Gently ladle soup into a blender, add the roasted garlic and puree until smooth*. OR add the garlic to the pot and blend with an immersion blender until smooth. Test soup for seasoning. If soup is too thick, add cashew milk to thin it out. Drizzle soup with olive oil and small pieces of roasted cauliflower. How much do you love garlic? If you use the whole head of roasted garlic, your tongue will burn…it is pretty strong! I like mine that way, but your 4 year old might not. You can always use less, taste it, and add more if needed. I like my soup really thick, so I did not thin it at all with cashew milk. If using milk, pour the soup back into the pot and reheat as necessary. If not looking for a vegan soup, chicken stock adds a lot of richness to this soup. If you have no interest in the “healthy” version, add heavy cream after the soup has been blended for a rich, decadent soup.